john4jack (Corvallis, Oregon, United States) on 16 April 2009 in Plant & Nature and Portfolio. We haven't been getting many of these kinds of days. There is an explosion of flowers on the trees, but generally they are against a blah pale sky. However, that obviously was not the case on this gorgeous April afternoon (actually it was Good Friday). Spring! Brilliant blue sky, need more of those. Yes ... with so nice white flower to set it more and more blue !!! Definitely a quote worth repeating, Jack. Your image is so beautiful and vibrant! Fantastic. Love the setting here. Wonderful light on these blossoms! and incredible clarity! Great work! Thank you for this view - it warms my heart! white and blue .. cherry and all the poetry of spring flowers in the sparkling snow..it 's georgous, John. Our days have been very gray and blah lately! This blue sky is amazing! Really nice composition! It is superb !!! Composition ,clarity and colors are wonderful ! Yes indeed ! A pure, intense springtime sky ! Exquisite with the flowers. Are these pear blossoms? I have an alarmingly similar post for tomorrow from 4000 miles away! Very beautiful. @jeff (aka dogilicious): I'm not certain what they are, but they are blooming all over the place. White and blue are such a gorgeous combination. Wow!! Such a gorgeous sky. I love the way the blossoms pop against the blue. (And what an interesting shade of blue that is!) Our pear blossoms are just about to bloom here, too. They're gorgeous, but they have a rather disagreeable scent to them. Bountiful blossoms against that sky, like you said, "Incredible"
What a sight to see trees full like this. Fabulous. The flowers have taken the place of the clouds. You captured the blossoms and sky perfectly. Lovely Jack! The first thing that popped into my head was the feeling that you get as a kid when you get to finally wear your new Easter dress---I guess the guys won't get that, but for me it is a feeling of excitement about spring and Easter! Ahh, so beautiful! Spring has its powerful charms, and you caught a perfect and lasting glimpse for us all. The blue and the white against each other shining so perfectly. They look like same sort of flower you had put about a couple of days ago. But a completely different colour tone. @Ajay: This is a new flower for my posts, Ajay. The perfect backdrop for these lovely blossoms, I'm hoping we get that too, right now it's misty and raining. This is the most striking blossom image I've seen in a long time. That deep blue sky is the factor that supports the detail and wonderful colors in the branch. Nice.... very nice. @Don: Thank you, Don. The potential for this kind of shot is rare around here. What beautiful contrast. 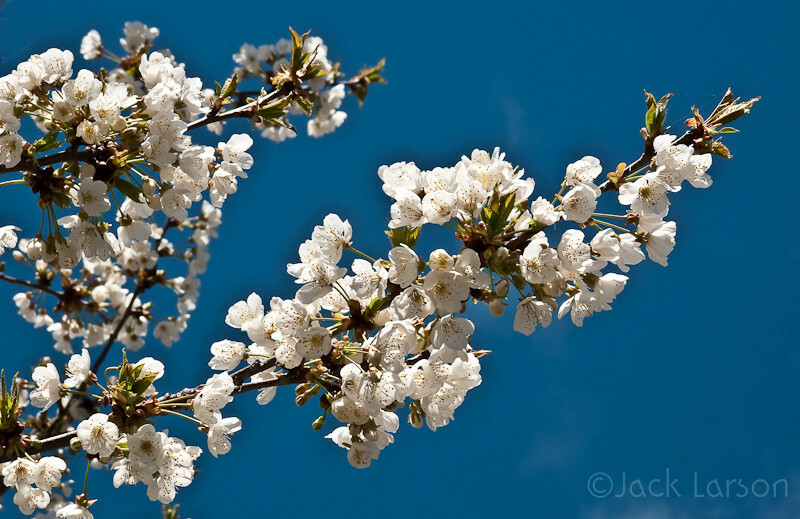 You're right in how a richer, more saturated sky makes these blossoms stand out so well. The ideal natural contrast. @Diane Schuller: Have a great time at your workshop. Incredible sharpness ! Love when it's so pure ! A water to wash my eyes up ! You made that POP. Nice. I'm back. I am afraid most of our Spring blooms were blown away but I did see new ones appearing today! This image gives me hope that our color will return. What a vivid sky! Very nice. Beautiful. The contrast between the lovely white flowers and the sky is outstanding. Une très belle bouffée de printemps. Wow! This is absolutely breathtaking! The sky is gorgeous and the blossoms against it make it for an outstanding photograph! Love it! Ah, explanation of the beautiful blue sky - "Good Friday" - of course that is why! Lovely shot. Very nice against the blue sky. Splendide image du printemps! Un magnifique cerisier en fleurs! Remarkable macro on the flowers. The sky is great as well but I think the beauty in the photo stems from the flowers themselves (no pun intended)! Great shot. What a beautiful capture, Jack, both of the blossoms AND the sky! @Judy: Bountiful blessings for certain! Wonderful shot - great colors! Love the deep blue... beautiful shot!!! Incredible sky, and even more incredible blossoms!!! Truly a gorgeous shot Jack!! Congrats!! Nice light on the blossoms. Yes this is an incredible sky ! Wonderful !!!! Very sharp details of the flowers! Georgeous white blossoms against the blue sky. Beautiful! Wow! the flowers are simply amazing against that background. Great Friday I'd say! Hard to say if the sky or the flowers are more beautiful!